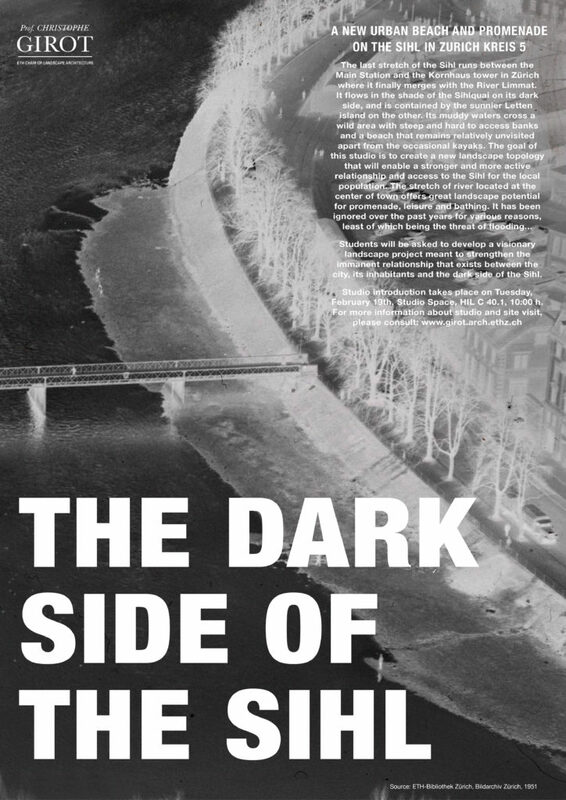 The FS 2019 Studio “The Dark Side of the Sihl”, will ask students to design and develop a new landscape project along a stretch of the Sihl river in Zürich Kreis 5. The studio includes a compulsory site visit in the weekend of 23/24.2.2019, for 40 CHF. Weekly on Tuesdays and Wednesdays, Atelier at ETH Hönggerberg HIL C40.1. The design will be developed in groups of two, with individual assignments. Language of instruction is English; Assistance in English and German. From its source in Canton Schwyz, down 73 kilometers to the last stretch where it runs between the Zurich Main Station and the Kornhaus Tower in Zürich, the muddy Sihl River finally merges with the blue waters of the Limmat. On this last stretch, it flows in the shade of a quai located on the dark side of the Sihl, hence the title of this studio. The Sihl has a different colour than the Limmat due to the geography of its origins. The stretch of river that we are interested in, is contained on one side by the sunnier Letten island, which is nothing more than a canal structure perched above its bed. The area located at the foot of the canal wall has become relatively wild over time with steep embankments that are hard to access. This wilderness is a great plus for the Sihl and the beach located in the bend next to the Main Station and remains relatively untouched apart from the occasional kayakers that gather there. The riverscape located at the center of Zurich could offer great leisure potential for promenade, bathing and meditation. The FS 2019 Studio “The Dark Side of the Sihl”, will ask students to design and develop a new landscape project along a stretch of the Sihl river in Zürich Kreis 5. The perimeter under study roughly 1 kilometer long will extend from Platzspitz to the Kornhaus Tower. The site has strong potential for recreational and social use, but has been ignored over the past years for various reasons linked to infrastructure planning, a heavy drug scene and last but not least the constant threat of flooding. The Letten bank located on the other side was transformed into a very successful leisure spot twenty years ago despite its reputation as the crucible of the Needle Park heroin drug scene of the 1970’s and 1980’s. There is now good reason to believe that Zurich is ready to transform the other bank located in Kreis 5 vis a vis of Letten that we have called the Dark Side of the Sihl, into an entirely new experimental urban river environment. The studio will try to formulate an innovative approach to riverscape design by modifying the existing terrain and creating a set of new topographies, compatible with the river, but also capable of generating a variety of activities. The goal is to create a kind of landscape that will enable a stronger, more active relationship with the Sihl for the local population and visitors alike. Emphasis will be placed on access, new places and amenities, as well as possibilities of going into, along and across the river particularly during the dry season. The landscape design method used will be that of topology that has been developed and refined at the chair over the past decade. Work will begin by identifying local conditions in the neighborhood and along the river edge, to then develop a set of site-specific landscape interventions that will be agreeable both to the river, its wildlife and its inhabitants. In order to be successful, the designs will need to intertwine the Sihl river, its new activities and natural potential with the life of the surrounding urban fabric. Topology is focused on the art and science of landscape surface manipulations using different materiality and textures. The approach of the studio is based on the use of 3D point cloud models as a design tool. The method has been developed at the Landscape Modelling and Visualizing Laboratory (LVML) over the past decade. Students will learn how to develop a large-scale landscape project by using advanced 3D modeling and visualizing techniques. From the site visit up to the final presentation, a series of workshops will accompany the regular desk critiques and design reviews, enabling each students to develop their landscape design skill using digital and physical modeling. Analogue design tools will be combined with digital design tools in the early design development phase. For that purpose, a series of seminars will be taught that include sandbox sketching, sand modeling and CNC prototyping, iterative 3D point cloud modeling and visualization techniques. Students will be encouraged to develop their own design strategies and adapt the topological method to their projects. Readers, manuals, historic documents and lectures will be made available to students. A studio reader combined with some lectures by expert will support students in the development of their landscape projects.